A peasant woman trudges through the snow, her back to the viewer, her arms taut with the weight of two buckets. 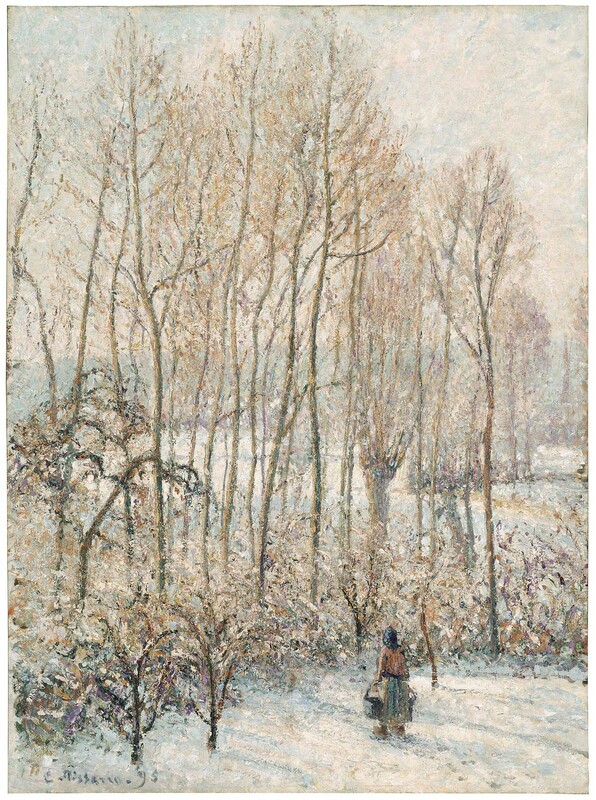 The picture combines Pissarro’s sympathy for rural labor with his interest in winter landscapes, whose infinitely varied shades of white—from pearl pink to ice blue—he returned to again and again throughout his career. He likely painted this scene from the window of his studio, a converted barn in Éragny, a tiny village fifty miles outside Paris, where he could work directly from nature but protected from the elements. According to a letter from Claire Durand-Ruel Snollaerts, Catalogue Raisonné Camille Pissarro, to the MFA (2003). The painting was previously thought to have been dated 1894 and sold to Durand-Ruel in that year. According to notes in the MFA curatorial file.